The summit included top management executives from CSSC and MAN Diesel & Turbo. At a signing ceremony in Anqing, Anhui province on 8 October 2015, CSSC Marine Power Co., Ltd. (CMP) renewed its contract with MAN Diesel & Turbo for another 10 years of production of four-stroke medium speed engines. CMP is an engine-manufacturing division of the Chinese State Shipbuilding Corporation (CSSC), one of the largest Chinese shipbuilders. The new agreement marks the renewal and continuation of a cooperation that first started in the 1980s. MAN Diesel & Turbo attendees at the ceremony included Klaus Engberg – Senior Vice President and Head of Two-Stroke Licensing, Ulrich Vögtle – Vice President and Head of Large Bore Four-Stroke Licensing, Dr Manfred Biedermann – Head of MAN Diesel & Turbo, China, and Dai Jun – Head of Licensing Support, China. 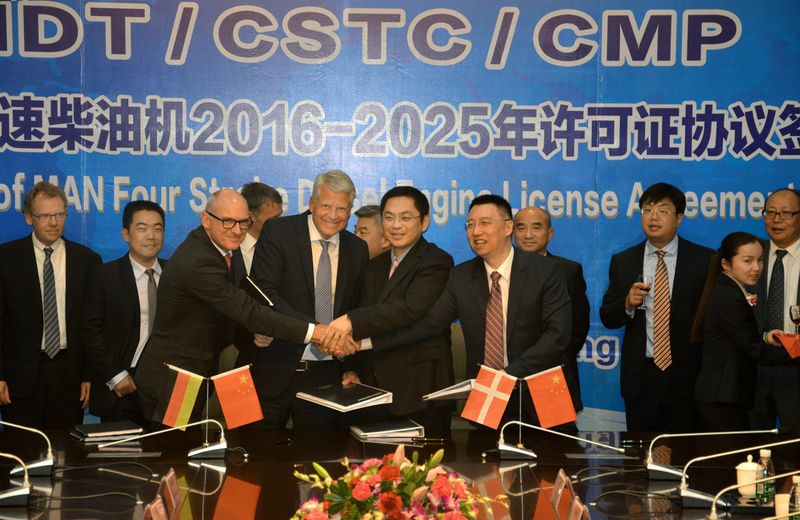 Ulrich Vögtle – Vice President and Head of Large Bore Four-Stroke Licensing – said: "We view our relationship with CSSC as pivotal to our success in giving Chinese customers access to our technology. Accordingly, we are very happy and proud today to be able to officially announce the continuation of our excellent business relationship for the next decade." To date, CMP has delivered 5,000 units of MAN four-stroke diesel engines, equivalent to 4,700,000 kW. CMP also holds a licence agreement for two-stroke MAN B&W engines, which it too renewed for a decade at a ceremony in Beijing earlier this year. Headquartered in Beijing, CSSC handles shipbuilding activities in the east and south of China and consists of various ship yards, equipment manufacturers, research institutes and shipbuilding-related companies. Some of the best-known shipbuilders in China, such as Jiangnan Shipyard and Hudong-Zhonghua Shipbuilding, are currently owned by CSSC. Zhenjiang Marine Diesel (ZJMD), CMP’s predecessor, was founded in 1976 and signed a 15-year medium-speed licensing agreement with MAN Diesel & Turbo on 13 May 1980. This was subsequently extended in 1995 and 2005.